The past two weeks have been spent on examination preparations as well as exams themselves. Just resumed work on FYP in week 16. 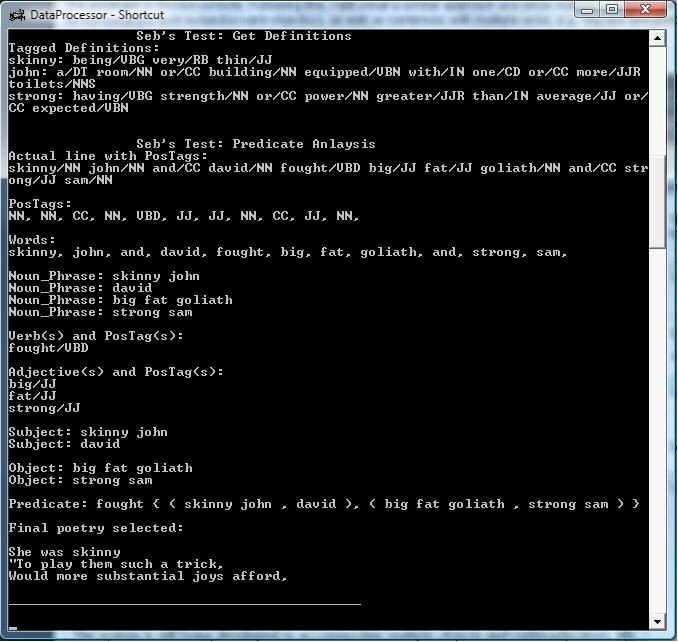 Have successfully modified the code to relate multiple objects to the verb as well. This was achieved through the use of a similar approach to having multiple subjects. It was assumed that the simple short sentence contained only one verb. All noun phrases located before the verb in the sentence were assumed to be its subjects, while all noun phrases appearing after the verb were assumed to be its objects. Below is an image of a sample run after the code has been modified. Next step will be to account for multiple verbs in one short sentence. CA2 (internal) has been scheduled for December 13th. Time TBC. External CA2 will be on either the 10th or 11th, subject to availability of tutorial rooms.